Parsing fact from fiction is about to get easier on Google News, as the search giant announced today it's bringing a 'fact check' label to its hub. Articles that contain fact checking on Google News and Google's News and Weather app will now come with a tag to highlight it in your news feed. Google News has used similar tags in the past to mark its articles, such as denoting a piece as opinion, using a Wikipedia citation, or an in-depth work. More recently, the service added a 'Local Source' tag in order to show outlets near the reader that were covering a major event. To find a fact-checking article, Google News searches for specific schema.org markups in articles, the exact criteria of which Google details on its support page. 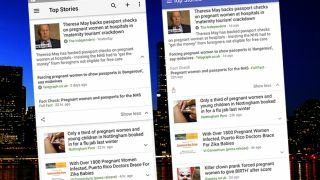 Articles tagged for fact checking are found in the expanded view of Google News starting today, and are active for the iOS and Android version of the News and Weather app in both the US and the UK. A Google representative told us there are currently no plans to expand the feature outside those two regions.